Our goalie was nicknamed the Walrus because he flopped around in the crease to smother the puck. He couldn’t stand on his skates for very long, or at all without clinging to the post, and he only did the splits when he lost his balance. Our defence lacked the motor skills to skate backwards, but they knew enough about the game to realize where they should be even if they couldn’t get there. One gripped his stick like a broom while the rest used them as tripods. Our forwards could skate fast without the puck, but slowed down a lot with it. Back-checking remained a work in progress. The year was 1969. 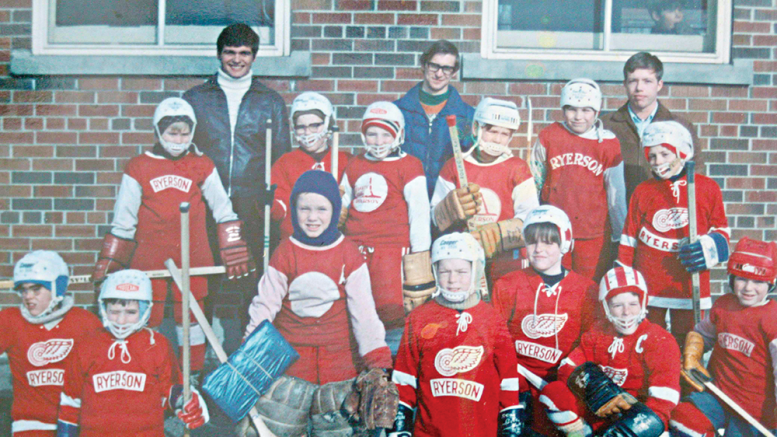 They were the Ryerson Red Wings and they played in the Novice Division of the City Recreation League in London, Ontario. This is a story about kids playing hockey, for fun. Harry, Jim and I were students at Western, and we boarded with a nice family close to the campus. At breakfast one morning their ten-year-old son told us that his school wouldn’t have a hockey team that season because no one wanted to coach them. We talked it over and agreed to volunteer. The principal was grateful and invited us to come in one day to meet the team. “Some of them aren’t very sure of the rules,” he cautioned. The kids were obviously happy to have not just one coach but three. Their hockey experience ranged from zero to, well, a little above zero, like the Fahrenheit temperature most Saturday mornings when our games were scheduled on an outdoor rink. We introduced ourselves, then chalked out a rink on the blackboard and outlined the basics: off-side, icing, face-off, infractions, power play, playing short-handed—all that. We knew we were facing a challenge when one boy asked, in all sincerity, how many on the team were “short-handed,” which prompted several boys to examine their hands and compare them with others. Harry had to go out into the hall for a moment. After a couple of practices we played our first game, in frigid conditions, and won. Our forwards skated hard and occasionally hit the net with their shots, enough to score three goals. The Walrus, for his part, flopped magnificently when the opposing forwards skated between our defence pylons but couldn’t lift the puck over his sprawling figure. Our first goal created near hysteria on the bench. The players jumped up and down and banged their sticks against the boards. One peed himself in his excitement, something I discovered when he couldn’t take his next shift because his pants were frozen to the bench. When I pulled him to his feet they made a sound like Velcro. We had a good first line, and a second that tried hard. So we mixed them up in the belief that everyone must play, win or lose. Our strategy got us into the playoffs—along with all the other teams. The kids battled their way to the semi-finals, winning two games against better sides, and everyone was on a high. Then the adults got involved. The parents of our best players asked that we bench a couple of our worst for the semi-final. We declined, explaining that if we were to win as a team we would also lose as one, but everyone would play. We lost the game 6-2, and our season ended. A couple of parents were ready to take us to court, the others thanked us for giving their sons a chance to play competitive hockey. No one on the team blamed anyone else for the loss. They were all disappointed, of course, but for the right reason—we weren’t nearly as good as the team that beat us. That all happened exactly 50 years ago. Those kids are now approaching 60, and I wonder if they took something away with them. Harry and I meet up quite often now, as we live close to each other. Jim passed away five years ago. He became a school principal, loved by staff and students alike. No surprises there. I recently spoke to the coach of a traveling team that plays in some of the big arenas in the GTA. He told me that whenever he visits an unfamiliar arena he looks at the championship team photos in trophy cases and on “walls of fame.” He looks for the kids who aren’t smiling, the ones who likely didn’t get to play in the big game. You learn a lot about teams from those photos, he says. Hockey, like most sports, is a different game now. The investment in time, money and commitment that families make these days is out of sight. You think of the hundreds of miles that teams travel in a season, the weekends devoted to hockey right through the long winter. For many kids the benefits are huge: teamwork, fitness, discipline, leadership, time management—and for a tiny percentage, maybe a shot at the big time. With so much invested who can afford to lose? Yet something can get lost along the way. Everything comes at a cost. Many kids experience emotional burnout and suffer debilitating injuries. Some feel they’ve lost their childhoods. Others don’t find the game fun anymore, especially when they see their parents screaming at their coach, or opposing players, or even them. And most, I suspect, would rather play on a losing team than sit on the bench. Coming second isn’t a consolation prize anymore. Who watches the battle for bronze in the Winter Olympics or World Juniors when gold is all that matters? A year ago, Sweden lost to Canada in the gold medal game. After the medal ceremony and national anthem, I watched in disbelief as the Swedish captain tossed his silver medal into the crowd. People like to say no one ever remembers who came second. But that’s one team I’ll never forget. Or that other team that came second: our Ryerson’s Red Wings of a half century ago. Maybe those kids are playing in some Old Timers’ League on a Wednesday night. Just because they still love hockey.